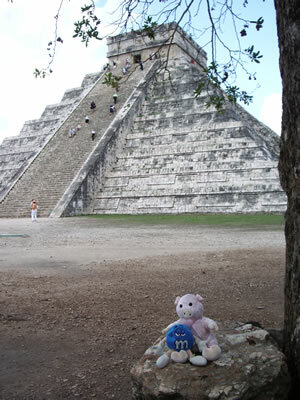 We are on the Yucatan peninsula of Mexico to learn more about the Mayan culture. Over 1000 years ago it was the homeland of the Mayan Indians. They had a very advanced civilization. They created a writing system and used the “zero” before the Europeans. Their astronomers created a very accurate calendar. We thought it was interesting that they had wheels on toys but didn’t use wheeled vehicles, probably because they were no animals to pull the vehicles. To get in the Mayan spirit we participated in a temazcal, a spiritual Mayan sauna to get rid of all the bad spirits in one’s soul and body. 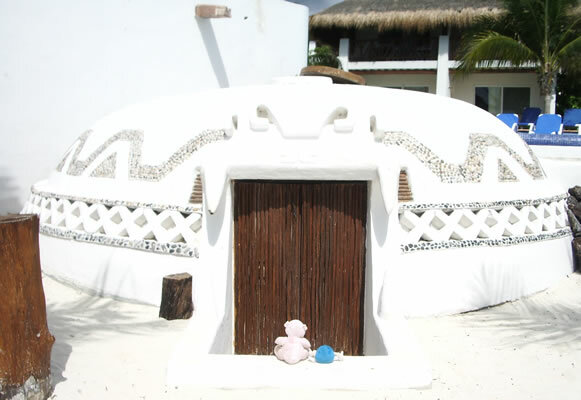 A temazcal is a low, domed adobe building near water. 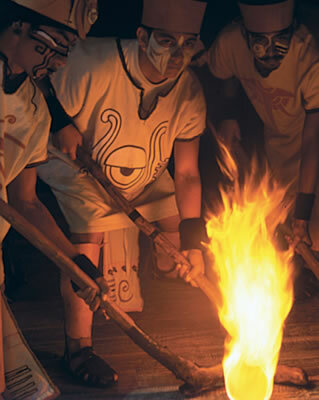 The Mayan Man of Fire heated lava rocks in a fire pit next to the temazcal until they were red hot. At sunset he blew the conch shell and we crawled inside the temazal and sat on the sand in a circle around the fire pit along with a shaman, a Mayan holy person. The Man of Fire brought in the hot coals, put them in the fire pit, then the door was shut. The shaman chanted and poured herbal water on the coals creating steam. Four times the Man of Fire brought in the hot rocks, which represented the elements: land, air, water, and fire. It was very dark and very hot, but relaxing. When the door opened the last time and we crawled out and ran into the ocean, which felt wonderful. It was dark and there was a full moon. 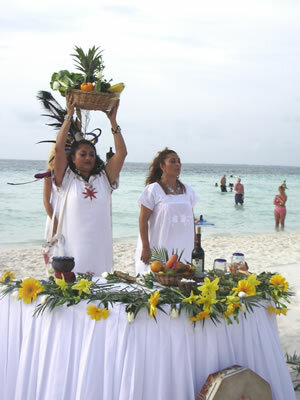 We were invited to a Mayan wedding that took place on the beach. Everyone wore white and stood in a circle around the shaman, Mayan musicians and the bridal couple. One of the musicians blew the conch shell to start the ceremony. In many ways it was similar to a Christian ceremony because the object was to bring about a life of happiness for the couple. When it was over we all waded into the water and threw flowers out to sea. Like all weddings it was very beautiful. One of the great Mayan cities is called Chichen Itza, where there is a huge pyramid temple to Kukulcan, an important figure in Mayan life. Near the temple is a huge ball court where they played a ballgame that was a combination of soccer and basketball. They had to get the ball through a hole on the side of the wall without using their hands. It was both sport and religion. Sacred songs were sung. The winners of the game were treated as heroes and given a great feast. The penalty for losing a game was often death. Mayans believed that human sacrifice was necessary for the success of their agriculture and trade. One night we went to a Xcaret, a Mayan theme park, where they had a fantastic night show that included the Mayan ball games. We learned about another ball game. It is similar to hockey but played with a ball of fire. After one of the players made a goal the fireball was scooped up in a leather pouch to put the fire out and another ball of fire was rolled in. It was very exciting to watch, especially in the dark. The Mayans built huge cities in Mexico, Guatemala, Belize, and Honduras. Scientists are not sure why they abandoned their cities about 1000 years ago. We still have a lot to learn about the Mayans. We will write again soon. From where? We are not telling! It will be a surprise! Take your time doing your homework.